40 under 40: Craft Futures which will run July 20, 2012 – Feb. 3, 2013 will feature the work of Jamin Uticone, Black ash basketmaker and owner of Swamp Road Baskets from New York state. This exhibit features 40 artists born since 1972, the year the museum’s contemporary craft and decorative arts program was established at its branch museum, the Renwick Gallery. “40 under 40: Craft Futures” is presented in honor of the 40th anniversary of the Renwick Gallery. Nicholas R. Bell, curator at the museum’s Renwick Gallery, selected the artists and is organizing the exhibition. The museum intends to acquire works by every artist in the exhibition for the permanent collection to mark the anniversary. After it closes in Washington, D.C. the exhibition will tour nationally. Steven Cole has donated baskets by Jamin to the Renwick in part to highlight his admiration of current makers of traditional American baskets and his concern that too few young makers are entering the field. Basketmakers will be hearing more about the Renwick Gallery as well as the names Nicholas R. Bell, Steven R. Cole and Martha G. Ware in the near future. The buzz is building for another event and I can't wait to tell you more. The Smithsonian American Art Museum in Washington, D.C. celebrates the vision and creativity of Americans with works of art in all media spanning more than three centuries. The museum’s branch for craft and decorative arts, the Renwick Gallery, is located on Pennsylvania Avenue at 17th Street N.W. It is open daily from 10 a.m. to 5:30 p.m., except Dec. 25. Admission is free. Metrorail station: Farragut North (Red line) and Farragut West (Blue and Orange lines). 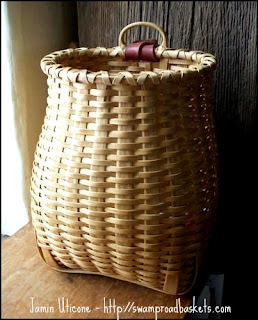 For more about Black ash basketry and basket collecting visit BasketMakers.com.